4 soverom, 3 bad, stue, spisestue, kjøkken, 8 sengeplasser. Bad 1 er ensuite med hovedsoverommet og har både et innendørs og en utendørs dusj. Bad 2 er en familie bad med dusj. Bad 3 er ensuite med det 4. soverommet. En hårføner og elektriske adaptere er gitt. POOL - bassenget dekk har solsenger, nyanser, bbq, dusj og en bassengkanten sala for al fresco dining. Røyking - villaen er røykfri innendørs, men dekk og hage kan brukes av røykere. BARN - en barneseng og barnestol, eller en ekstra madrass for et barn kan gis. TELEFON - gjestene er utstyrt med en lokal mobiltelefon HOUSEKEEPING - med en full bytte av sengetøy tilbys en gang per uke. Bassengrengjøring og hagearbeid tilbys 2 dager i uken. Once more it was great to be back, this time for a fifth year. The peace and tranquility of this lovely estate was so welcome after what was a nightmare journey beginning with Manchester's snow and fog bound airport! What was also great was the welcome from John & Kay as we arrived - just like coming home to good friends really and, the same with previous returning regulars, it gets more difficult everytime to write a different review. You just can't do any better than to say great place, great location and wonderful hosts with good supporting staff....the best compliment is to go back (again) and, like many other extremely satisfied guests, we've already booked that - Feb 20 seems a long way away! As always when we stay at one of the villa's of John & Kay we feel like we are home. John & Kay are the 2 nicest persons in Hua Hin, their villa's are the best. Quality of the houses is 110%, all you need is there.... and more. Always when we think John can't do better he improves! This was our fifth visit to Busaba having previously stayed in Villa 11 and Villa 7. 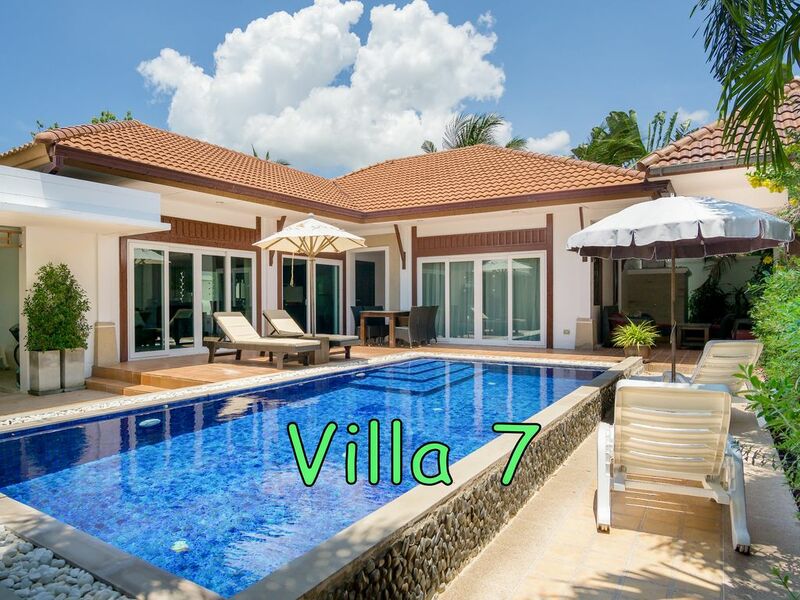 We keep returning to this place because it offers everything we need for a family holiday .On this occasion there were seven in our party and Villa 11 suited our requirements perfectly. As always John and Kay made us most welcome and were always on hand should we need any advice or help. We would heartily recommend Busaba Villa11 to a family group looking for peace and quiet in a lovely setting. Hua Hin itself is a lovely town with all amenities at hand for a wonderful holiday. Wunderschöner Urlaub, wie immer alles super! 15th visit - need we say more?? !! This was our fourth visit to Busaba and we have booked to return later this year. Definitely turning into a (most enjoyable) habit! This time we stayed in Villa 11 with another two couples and find the villa ideal for friends and family. Busaba is ideally located in a very quiet and secluded area of Hua Hin but is only a short tuk tuk ride away from the town's many amenities. John and Kay are the most attentive of hosts, nothing is too much trouble. As I say, our next visit will be our fifth which really tells you all you need to know! We have also stayed in Villa 7 which is equally nice but slightly smaller. Also have to make a mention of Olive restaurant which is two minutes walk from Busaba. They serve wonderful Thai and Italian food at very reasonable prices. So looking forward to our return in November. To John and Kay - many thanks once again. Rates shown are for 5-14 nights For longer or shorter stays please ask for a quote Cleaning, electricity, water and internet are included in the rates Book and pay securely online with HomeAway.